The renowned lottery winner, Barbara Wragg (known as the ‘Lotto Angel’) recently died in May at the age 77-years-old. Hundreds paid tributes at the funeral of the ‘Lotto Angel’, who won £7.6m and gave most of it away. Former hospital worker donated money to hundreds of groups and individuals – as well as buying house with her ‘dream’ bay windows. 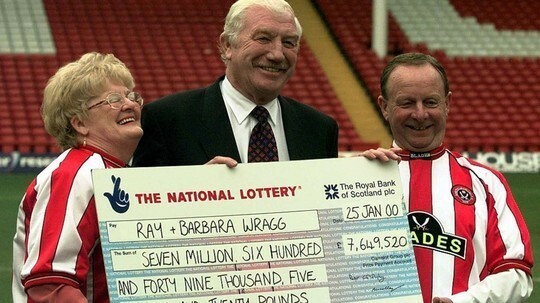 Barbara Wragg, within hours of winning the National Lottery jackpot in 2000, had already told husband Ray how she wanted to spend her winnings. She wanted to give it to those in need. For the next 18 years, that’s exactly what she did. This former hospital worker – who died in May – gave away an astonishing £5.5m of her £7.6m jackpot. Countless individuals benefited from her generosity. In her home city of Sheffield, she became known as the Lotto Angel. “She used to say she couldn’t believe how lucky we’d been to be able to help so many people,” Ray tells The Independent today. Tributes have poured in for the 77-year-old who passed away with sepsis. She used the 2000 win to secure the futures of their three children and six grandchildren as well as wanting to give to those in need. Cancer charities and Sheffield’s hospitals were major beneficiaries – it was the smaller cases which perhaps best show the sheer human impact of the couple. The good deeds started the week after they scooped the jackpot. Plans to open a teenage cancer unit at Sheffield’s Weston Park Hospital – a cause close to the couple’s heart after one of their daughters was diagnosed at 17 – had been struggling for funding. Before taking early retirement, Barbara had worked in another city hospital. There, she saw first-hand how only having one bladder scanner caused pain for patients having to wait for its availability. She spent £9,000 buying another. None of which is to say the couple did not treat themselves. They bought their dream house and secured their families future. Imagine if all lottery winners were this generous! The world would be a much better place. Maybe you could make a big change if you win! Play at OneLotto to have the chance of becoming the next big winner!